We're in the back half of the summer and the new school year is just around the corner. Are you dreading the bill for your back to school shopping? Well here's how to keep your spending to a minimum. Schools are very socially competitive places, and having school supplies branded with their favourite TV show, pop star, fashion brand etc. might seem like it will help your child's popularity. The problem is that this type of branding is very expensive, and fashion can change quickly.No matter how sure your child is that they need to have a Teen Titans schoolbag, a Coach hand bag, a One Direction binder, or a SpongeBob pencil set, it's not really going to benefit their education or save you money.To start with, buy plain stationary. Jotters and folders can be decorated with magazine clippings or printed Internet photos to make them more exciting, don't waste money on branded or decorated stationary.After school starts, your child is likely to discover that fashions have changed and something else is cool. If more equipment is required later in the year then it may be best to wait and buy beloved brands after the ‘back to school rush' as most of these items will be cheaper then anyway. Buy textbooks online with enough time that they will arrive in time for the start of school. Buying from high street bookstores is time consuming and often more expensive. Get together with other parents to see if you can buy, sell or swap school uniforms that have been outgrown, old textbooks and assigned reading books, etc. Don't stop with other parents, if friends or siblings have children in school or recently left, they may have equipment you can buy or have as well. Brightly coloured stationary and supplies are less likely to be left lying around in the classroom and lost, so you're saving money on replacements. Funny shaped erasers or pencil tops may seem like harmless fun, but the will be lost or broken just as easily as cheap, plain equipment. If you're child insists, allow them one fun item. If you have sports or musical equipment to buy, look at second hand and reconditioned items. You may want the best for your child, but children's hobbies and extra-circular activities can change fast so that brand new Oboe might end up gathering dust in the corner. 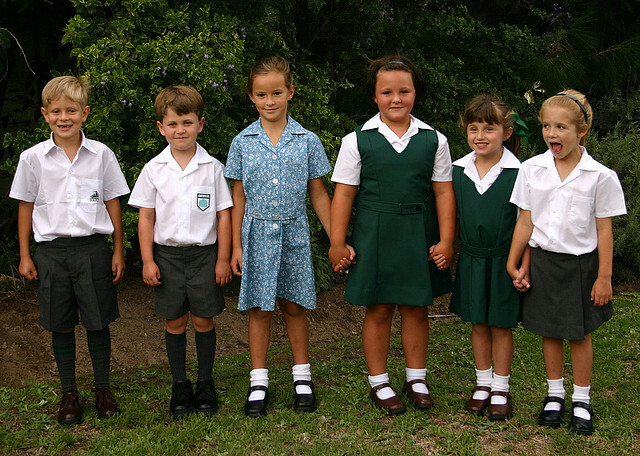 To begin with, you only need two uniforms for each child. One for them to wear, with the other in the wash. After term starts uniforms are likely to drop in price, so pick up the extras at a later date. Sew nametags into all your child's clothes, and mark their stationary when possible. If your child returns from school without something, then be sure to ask about it and follow up. Use Money Dashboard free budget software to keep track of how much you're spending on back to school shopping, and be aware that the extra spend will affect your budget for the month.